The Slow TV Blog: Slow Down - a Slow TV and Slow Radio show - on the Radio! Slow Down - a Slow TV and Slow Radio show - on the Radio! 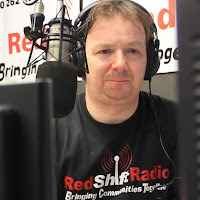 The Slow TV Blog will be going live on the radio from 8th September with a brand new dedicated slow show, thanks to RedShift Radio in Nantwich, Cheshire! Thursdays 8pm to 10pm (UK) will be the time for lovers of Slow TV, Slow Radio and just going slow. The first hour will explore Slow TV and Slow Radio news and reviews, plus analysis and interviews, dedicated features and of course relevant music. The second hour will be to do what has been talked about: Slow Down! Carefully curated playlists and relevant requests will give that late evening wind-down vibe. You'll be able to listen anywhere via the RedShift Radio website, there's a dedicated app for smartphone users, interaction via their Twitter and Facebook pages, and shows already broadcast will be available from RedShift Radio's MixCloud page (and embedded here on The Slow TV Blog). If you're involved in making Slow TV or Slow Radio of any sort, do get in touch - I'll likely be getting around to contacting you in the next few weeks as I begin arranging interviews! New season, opportunity to get on with all the things the summer has stopped you from doing and a new radio show. Tune in to Slow Down on RedShift Radio from 8th September. Also keep Saturday 10th September 6:45pm pencilled in... I'll be introducing regular live webchats and video broadcasts. Subject to satisfactory tests, I intend starting these on September 10th.